This is one of the best units in Barona Beach - ground floor looking directly onto the pool with the lake beyond. You can watch your kids swim in the pool while you sit on your own private patio. The back of the unit looks out onto orchards, vineyards, and Mission Hill Winery. Parking is directly behind the unit, making for easy access. The unit is spacious, approximately 1300 square feet. The unit is equipped with luxury furnishings and art. The living room has a 40' flat screen TV with surround sound system and 5 disc CD/DVD/ipod player. The master bedroom has a 32' flat screen TV and an ipod alarm clock radio. The den area has a 37' flat screen TV with DVD player. The kitchen has granite counter tops and stainless steel Kitchenaid appliances, and is fully equipped with all of the appliances, cutlery, plates, utensils, etc. The dining table seats 8 people. The unit contains a full size washer and dryer, and a gas barbecue and patio furniture. Boat slips are available for rental through the front desk, for an additional charge. The master bedroom has a Queen bed. The second bedroom has a Queen/Double bunk bed. The Den has a pullout bed. All beds have luxurious linens and duvets. Both bedrooms have en suite bathrooms, and there is a third bathroom on the main floor. 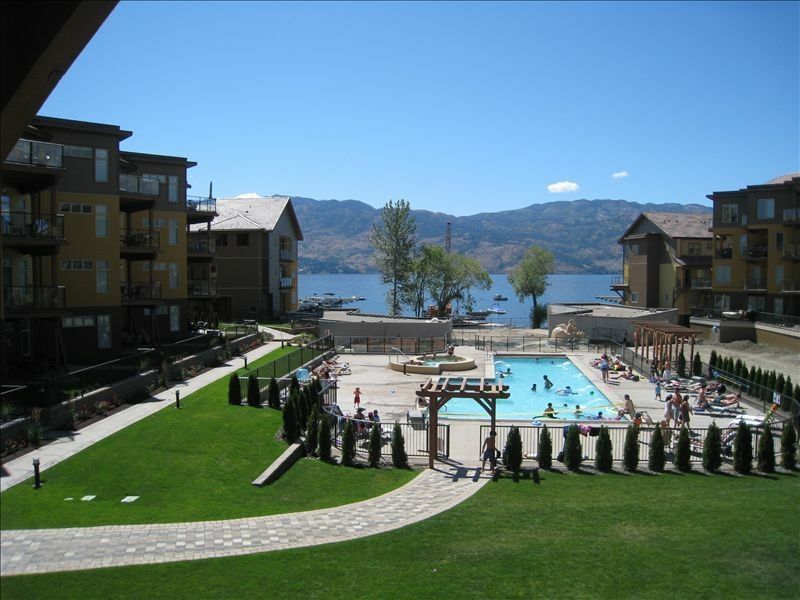 Barona Beach is located on Lake Okanagan, and is surrounded by orchards, vineyards and wineries. There is 600 feet of sandy beach, a pool, hot tub, and gym. Recreation options are nearly endless - Boating, numerous world class golf courses, downhill skiing, mountain biking, wine tours, spas, cycling, and excellent restaurants. We are a professional couple with two young children who live in Vancouver. We love Kelowna and visit frequently throughout the year. We chose Barona Beach because of the unique location and high end finishings. You cannot find another waterfront property of this quality surrounded by orchards and vineyards. Free wireless internet is available in the unit. (2) Both bedrooms have balconies. Large patio looks onto pool. Everything we needed was there and there was plenty of room for everyone. We'd stay there again. I would certainly recommend this condo to everyone that is looking for a hotel-style resort with its clean, minimal and modern furnishings, and equiped for comforts of home. It was quite a bonus to our guests when they relized they had their own balcony as well as a bathroom. This spacious condo is a gem inside and out, with the view and path down to the water and the private pool, we will certainly be visiting again. Thank you. I rented this property a month ago and we couldn't have had a better experience. The owner was very accommodating, the location was close to the wineries, the view was gorgeous and the townhouse itself was very nice. I would definitely like to stay here again and would recommend it to anyone. Thank you! This townhouse has everything that a person would need and much more for a beautiful holiday. The pictures were very accurate. The townhouse was stocked with supplies that were not even mentioned on the website. Very clean, beautiful place with a great pool and hot tub, would certainly recommend this townhouse to anyone. Owner was very accomodating. Loved the fact that we were so close to the pool and the pool was heated! Well maintained unit and property. Exactly as advertised. We had a couple of small minor glitches, ie. BBQ and internet, but owner was very helpful and all issues were quickly and adequately resolved. We would definitely consider staying here again. Very children friendly. I found this accomodation 5 star! Very clean, beautiful decor, well stocked kitchen, amazing complex, so close to the lake and the best amenities. I will re-book for next year! Rates are slightly lower during early and late summer period. Please enquire for details. Rates are inclusive of cleaning fee and all taxes. Rates DO NOT include fee charged by VRBO to guests (approximately $150 per week). Cancellations made 60 or more days before your arrival date will be provided with a full refund. Cancellations with less than 60 days notice are NON Refundable unless we are able to rebook the cancelled dates.